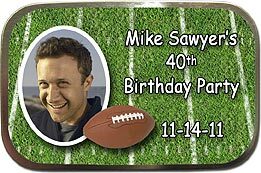 "Love your photo party favors (I'm a regular customer) and noticed you have photo mint tins - so ordering these was a no brainer for me. I filled them with Hershey's Hugs & Kisses. Needless to say, they were the absolute hit of the party." - Brenda B. "I was searching for photo mint tins for my wedding when I came across your website. This was even better than I imagined. The tins are absolutely beautiful and I was able to put M&M's in them in my wedding colors. They were the perfect wedding favor I dreamed of." - Jenelle P.
"I had to write to tell you how gorgeous these photo mint tins turned out. First, I never expected the tins to be as large as they are. Secondly, the picture on the tin, looked like it was taken yesterday not 58 years ago. What a great birthday party favor! I am beyond thrilled and I will most certainly be contacting you again for my next party. I cannot wait to hear what my guests have to say!" 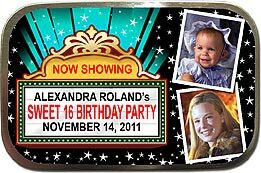 If you've been searching for the perfect favors for your party, then you're going to love our hinged photo mint tins. These unique favors are personalized with your photos and message, and can be adapted to fit any special occasion. These LARGE silver favor tins are 3.9 inches by 2.5 inches (big mint or Altoid size) with a hinge. They are .875 inch deep (nearly one inch). They are food-grade, so you can confidently fill them with chocolate or other candy. The lids close securely, so you can keep them in your purse or pocket. 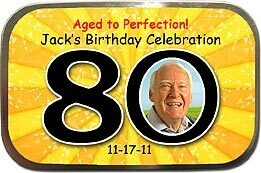 Just choose one of our original designs for the top of your mint tins, and we'll use your photo and personalization to create one of a kind favors just for you. Your custom favors are professionally printed on high-gloss labels with a superior glossy photo finish and adhered to the lid of your tins. They come fully assembled, with the labels already on top. Nothing left for you to do, but fill these containers with your favorite candy or memento. We have over 100 original designs (not found anywhere else) created by our artists for birthday, anniversary, wedding, sweet 16, bar mitzvah, first communion, christening, graduation and more, including new theme party designs (luau, fiesta, sports, casino night, Hollywood and movie night, holidays and seasonal). Make sure you check them out. Candy tins are sold empty for you to fill with the chocolates, mints or other items of your choice. You save money (because we're not charging you for cheap candy, which would also add weight to your package and increase shipping costs). Instead, you can fills these favor tins with what YOU like. Here's some ideas: Hershey kisses (or hugs and kisses), Jordan almonds, M&M's, jelly beans, red hots, chocolate chips, fun size candy bars, conversation hearts, sugar-free candy, salt water taffy, gourmet chocolates, macadamia nuts, cashews, bubble gum, candies in your wedding colors, homemade fudge, candy corn, Christmas candy and of course, mints. But it doesn't have to be edible. How about filling them with costume jewelry, Lego pieces, lipsticks, temporary tatoos, stickers, hair accessories, a keychain, seashells, scented bath salts or a gift card? The possibilities are endless! Over 100 Unique, Original Designs! Great for celebration for boy, girl, man, woman. ANY age. 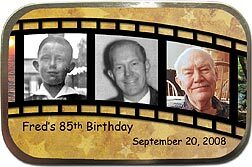 Filmstrip Unfilled Photo Mint Tins © Email us 3 of your favorite photos with your message and personalization. 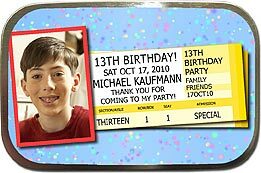 Great for ANY occasion: milestone birthday, graduation, anniversary, bar mitzvah, sweet 16, more. Star of David background available for bar mitzvah. Tickets Unfilled Photo Mint Tins © Email us 1 favorite photo with your message and personalization. Great for birthday, bar mitzvah, sweet 16, graduation, more. 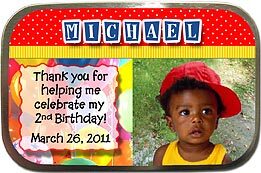 Bulletin Board Unfilled Photo Mint Tins © Email us 2 of your favorite photos with your message and personalization. Great for ANY occasion: graduation, birthday, bar mitzvah, etc. 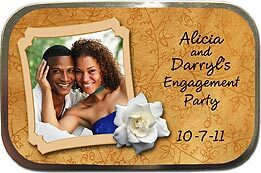 Gold Rings Unfilled Photo Mint Tins © Email us 2 of your favorite photos with your message and personalization. Great for anniversary, wedding, engagement party, bridal shower. 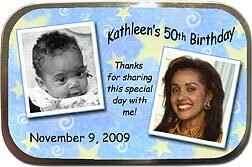 Stars Unfilled Photo Mint Tins © Email us 2 of your favorite photos with your message and personalization. 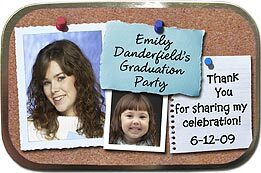 Great for ANY occasion: graduation, bat mitzvah, birthday, more. Available in 30, 40, 50, 60, 70, 80 (shown) and 90 Red Rose Unfilled Photo Mint Tins © Email us 1 of your favorite photos with your message and personalization. Great for anniversary, wedding, engagement, birthday, bat mitzvah, shower, graduation. 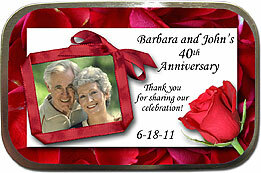 Elegant Unfilled Photo Mint Tins © Email us 1 favorite photo with your message and personalization. Great for wedding, anniversary, baptism, communion, birthday, more. 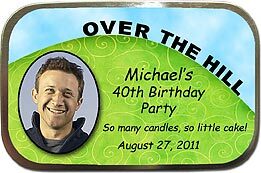 Over the Hill Unfilled Photo Mint Tins © Email us 1 of your favorite photos with your message and personalization. 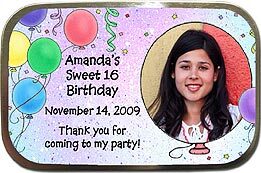 Balloons Unfilled Photo Mint Tins © Email us 1 favorite photo with your message and personalization. 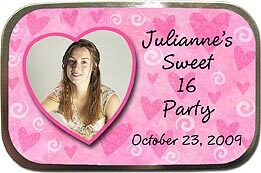 Great for birthday, sweet 16, any party. Hearts Unfilled Photo Mint Tins © Email us 1 favorite photo with your message and personalization. 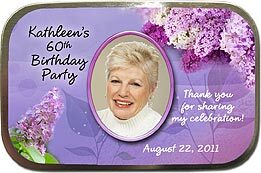 Lilac Dreams Unfilled Photo Mint Tins © Email us 1 favorite photo with your message and personalization. Great for wedding, birthday, sweet 16, any party. Gardenia Unfilled Photo Mint Tins © Email us 1 favorite photo with your message and personalization. 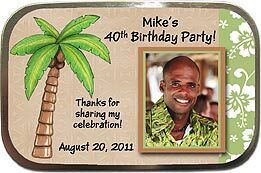 Luau, Tropical, Beach Theme Mint Tins Also: flip-flops, cruise, mardi gras, fiesta, more! Actual size of the hinged favor tins is 3.9 inches long by 2.5 inches wide and .875 inch deep. They are about the size of large mint tins or Altoid tins. The candy tins are silver inside and out, made of food-grade tin. 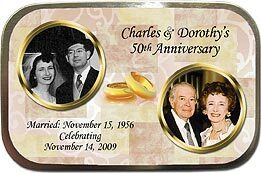 Your hinged mint tin favors come FULLY ASSEMBLED, with the photo glossy label already adhered to the top of the tins. (Other companies have fine print that says "some assembly required", which translated means you have to stick the label on the top - not as easy as it looks, because the label is almost the same size as the top of the mint tin.) We do the work for you at no extra cost! Personalized photo mint tins are sold empty, ready for you to fill at home with your choice of chocolate, candy or anything else you can imagine. We do not sell any mints or other candy fillings. We always email you a proof of your photo mint tin favor order within a couple of days of receipt, so that you may check it for accuracy, and we only send your order to production after we have received your approval. 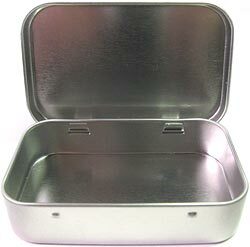 Please note: Shipping for hinged favor tins is different than our regular party favors, because they weigh a little more. 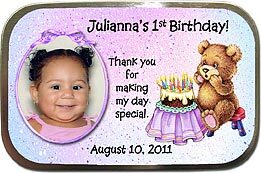 EMAIL your high resolution jpg photo (or photos, if the design requires more than one) for photo mint size tin favors to PhotoPartyFavors@aol.com. Please include your name, shipping address, phone number (in case we have any questions), what you're ordering, the name of the design, how many, the last possible date you need it by, the personalization desired, and confirmation that you have mailed (or will be mailing within the next 24-48 hours) your check made payable to Linda Kling. Any questions or comments about our unfilled photo mint size tins or other photo party favors? 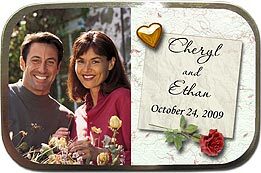 Send us an e-mail at PhotoPartyFavors@aol.com. You can also check our FAQ page for answers to common questions.